University of Nairobi (UON) 2019 January, April, May and September intakes are open for application and admissions. Below is how to apply and get your admission letter online. 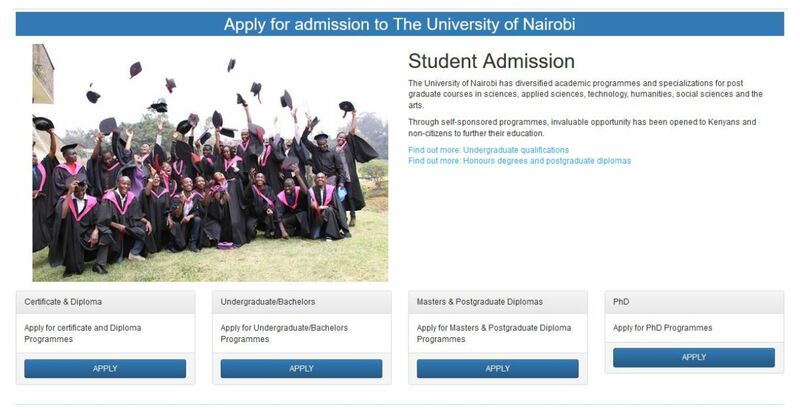 Application to study at the University of Nairobi for Private sponsored students (pssp) is done online. There is no need of looking for application forms. We have provided the procedure below on how to apply. There are different programmes for Certificate, Diploma, Degree, Masters and PhD offered in the above intakes. You should visit the online application portal to confirm whether a course you are interested in is offered in any of the 4 intakes listed above and take note of the application deadline. Register for an account by filling in the required admission information. An Email will sent to your email with a confirmation url. Promotion: Are you interested in making a living online while studying? Sell your Class Notes online at Muthurwa.com and get paid via mpesa daily.